Courtesy Fort Wayne native and Homestead grad Allyson Straka is the founder of Frozen Garden, which sells green smoothies. Allyson Straka began drinking green smoothies 13 years ago and has barely missed a day since. 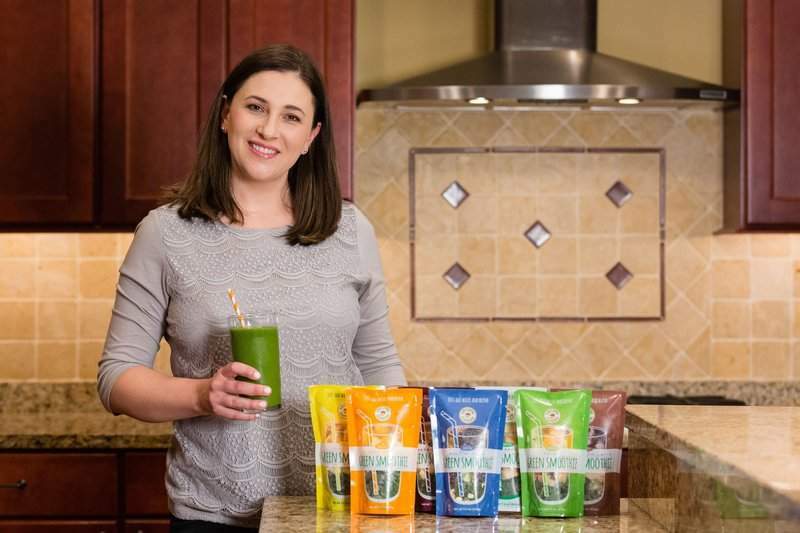 Her love for the power beverage led Straka to create Frozen Garden, a company that makes and sells green smoothies online and in retail outlets. That experience helped when the Fort Wayne native moved from Chicago to Chesterton, Indiana, and started Frozen Garden. Straka started thinking about healthy eating the first time she became pregnant. “I began to think about what I was putting into my body,” she said. She decided to cut out processed foods and get back into the kitchen to make meals instead of going to a drive-thru on the way home from work. By the time she was pregnant with her second daughter, Straka, a single mother, left the corporate world and became a certified holistic health coach to help others learn what she had been studying about reducing processed foods and cooking from scratch. Smoothies were part of the healthier diet. But clients became frustrated with the lack of convenience foods. “My dad asked me how I could make the smoothies more convenient to make,” Straka said. That's when she formulated the idea of preparing packaged ingredients for the smoothies she loved. In 2015, Straka started testing ways to create the smoothies to retain their nutrition and flavor, in a way that was easy for a consumer to mix up for a meal or quick snack. “I didn't want people to have to buy a fancy blender to enjoy a green smoothie,” she said. So, she bought a $19 blender at a discount store and started sourcing ingredients from nearby suppliers in Indiana and Michigan. By March, 2016, Frozen Garden was ready to roll out its product to the public. Straka moved her production to a 2,400-square-foot facility in Valparaiso. “We do everything ourselves – freezing, assembling. We control the quality of our product,” she says. In 2018, the company's sales were $250,000. Straka said she expects that to double this year. Along with being available for online purchase, Frozen Garden smoothies are in more than 100 grocery stores and retail outlets in Chicago, Milwaukee, Cleveland and Detroit, as well as in New England, the Mid-Atlantic, Puerto Rico and Grand Cayman. At one time, they were sold at Seven Sons farm in Roanoke, but there are currently no local retailers. “My mom keeps asking me when we'll be in Fort Wayne stores,” the Homestead High School graduate said. She hopes to sign an agreement with a retail outlet in northeast Indiana this year. Along with using local produce, Straka sources spices and seeds from nearby suppliers. The flax, chia and hemp seeds in the Frozen Garden smoothies come from Angola's Foods Alive, a retailer and supplier. The seeds go right into the smoothies and are a source of fiber, protein and omega-3 essential fatty acids, according to Matt Alvord, one of Foods Alive's owners. Alvord said he got to know Straka before she started Frozen Garden, through her work as a health coach. “She reached out looking for the highest quality and locally sourced ingredients possible,” he said. Alvord said Foods Alive also presses oils and makes crackers and salad dressings from the seeds. Straka said South Bend's Terra Spice Co. provides the spices for the smoothies. The other ingredients, such as greens, celery, cucumbers, parsley, berries, apples and pears, come from farms in New Carlisle, DeMotte, Chesterton and Mishawaka, as well as Berrien Center, Michigan. All of the ingredients are grown without synthetic pesticides or fertilizers. Smoothie pouches are BPA-free and made of plastic No. 7, so are good for most residential recycling programs, Straka said. Frozen Gardens' just-add-water smoothies come in nine flavors in pouches that will make a 20-ounce smoothie (for $6.99) or the 12-ounce junior smoothie ($4.49). Frozen Garden's website at www.thefrozengarden.com offers a subscription service to keep the smoothie packets arriving regularly at the customer's door. Straka said smoothie pouches are shipped in dry ice and will last in the freezer for six months. Along with creating a healthy product, Straka works on making sure that the work environment for her seven employees is healthy. “I'm big on hiring people who need flexibility, like people of retirement age or people who have worked for restaurants and don't want the late hours,” she said. On a recent snowy day, the schools in the area around Valparaiso dismissed early. Straka's business was recognized in 2017 when she was inducted into the Society of Innovators of Northwest Indiana for creativity, innovation and promoting economic growth across the region.